The shrinking size of whales over the 20th Century could help scientists detect when wildlife populations are in trouble, a study suggests. The analysis shows that the average body size of four whale species declined rapidly during the second half of the 20th Century in response to hunting. But warning signals were visible up to 40 years before whale stocks collapsed. The work appears in Nature Ecology and Evolution journal. Christopher Clements, from the University of Zurich in Switzerland, and his colleagues looked at records on the abundance and body size of whales caught by commercial whaling vessels between 1900 and 1985, after which a global whaling moratorium took effect. 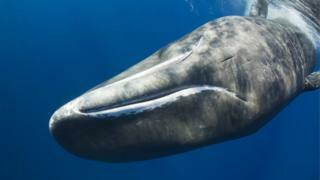 "We looked at data on blue, fin, sei and sperm whales and found significant declines in body size, with sperm whales taken in the 1980s four metres shorter on average than those in 1905," said Dr Clements. This probably occurred as the biggest individuals were selectively removed from the ocean through hunting. "This means that warning signals were detectable up to 40 years before a population collapse," Dr Clements added. A similar pattern has previously been reported for many fish populations, and has been interpreted as a response to fishing pressure. The results suggest that tracking changes in the mean body size might help to predict when populations are at risk of collapsing. "Our technique could be used to help provide other species of conservation concern. Moreover, it could allow interventions to be put in place to stop this happening," said Christopher Clements.